December 1941: The Japanese have attacked Pearl Harbor, bringing the United States of America into WWII. Thousands of young Americans are drafted into the Army Air Force and sent to England. Their mission: To destroy the industrial machine that supplies Hitler's forces, preparing the way for the liberation of Europe. Using airmen's memoirs and diaries, On Eagles' Wings chronicles the experiences of ordinary young men who risked extraordinary danger. Defying flak and the Nazi Luftwaffe, they were part of the greatest air armada the world has ever seen. With dramatic original color film, this is the story of the Mighty Eighth, as it has never been told before. 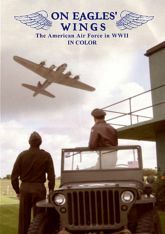 Featuring: Veterans' Memoirs; The British Royal Family; Clark Gable & Bob Hope; Dogfights & Bombing Missions; Hitler's Bunker; B17s, Liberators, Mustangs & Thunderbolts, Spitfires, Lancasters & Luftwaffe Aircraft.